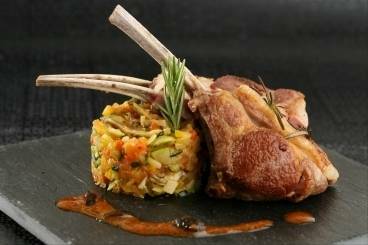 Rack of lamb is a cut taken from along the spine of the lamb and includes the ribs. Often sold whole, it is then cut into chops of individual portions of 3-4 ribs. 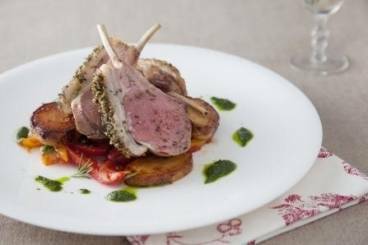 Rack of lamb coated with rosemary breadcrumbs served on a bed of Provencal vegetables with mini fondant potatoes and a basil and anchovy dressing. Rack of lamb with a lemon and black olive sauce served on a bed of green beans and cherry tomatoes. 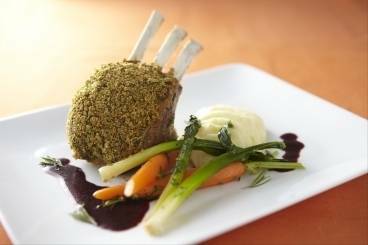 Tender rack of lamb served with gratin dauphinoise, green beans and red wine sauce. Perfectly cooked rack of lamb served with a home made salsa verde and oven baked aubergine Parmiggiana.